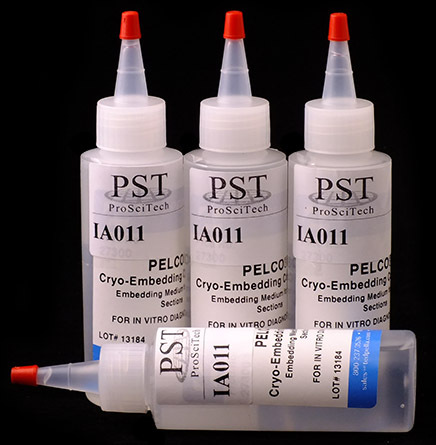 PELCO® Cryo‐embedding compound is a water soluble glycol embedding medium used in cryostat sectioning. This low viscosity compound ensures reliable freezing and smooth sections. 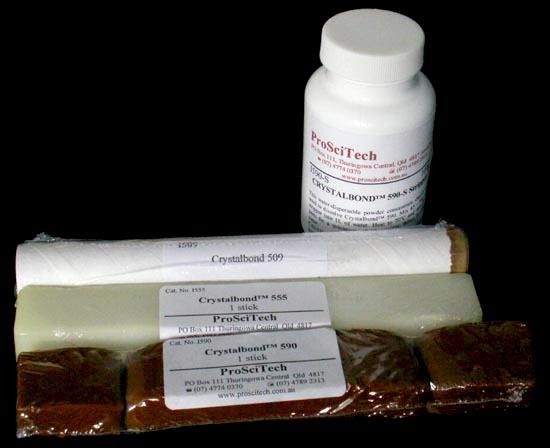 PELCO® cryo‐embedding compound is a fully compatible, cost effective alternative to Tissue‐Tek® O.C.T. Compound. A 50% discount is available for units expiring in October 2017. Please email us to inquire. It is a highly viscous, water-soluble embedding medium for frozen sections that "stays put". The gel is packaged in a pump-dispenser bottle that can instantly dispense the gel in any position. The dispenser has a built-in "guillotine" that cleanly severs the gel from the pump spouts and prevents any "stringy" medium from pulling away when the bottle is removed. Simply dispense gel on room temperature blockholder. Use cold heat extractor to form a base layer. Dispense additional gel. Place the tissue on top of gel. Use cold heat extractor to freeze tissue and form block. Each bottle contains 128ml, 12/case. Replaces the messy "runny" embedding media. Stick to where you want it. 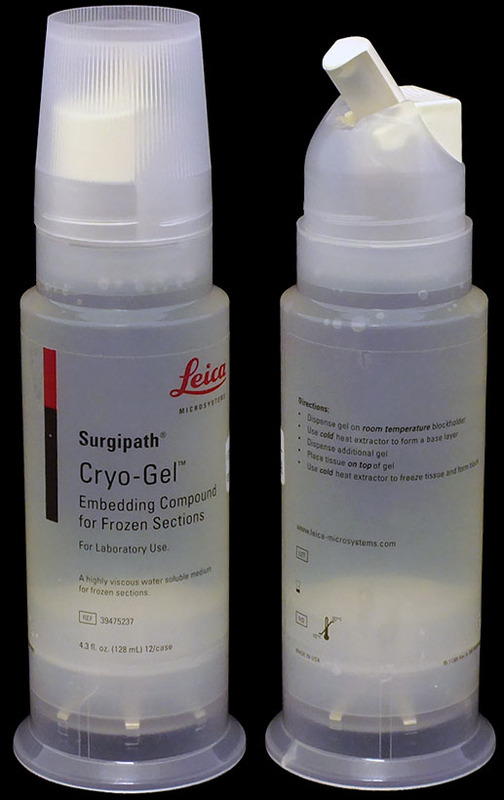 This embedding resin is an outstanding product used to support tissue for frozen sectioning. 5 years of shelf life. This is a much favoured water soluble glycols and resins compound that provides an excellent specimen matrix for cryostat sectioning at temperatures of ‐10°C and below. It leaves no residue during the staining procedure. Improves permanent adhesion of sections to the glass slide during prolonged staining procedures and washes. Good for JB-4 and JB-4 Plus Sections. Useful for immunofluorescent, immunoperoxidase and routine staining procedures. Store at RT. The main purpose of mounting media is to physically protect the specimen; that also includes anti-fadent components for fluorescent dyes. Mounting media are usually applied as a couple of drops onto the specimen, which is then inverted with a hanging drop onto a coverslip. 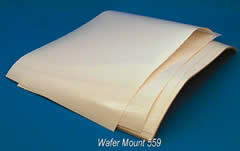 The mounting medium bonds specimen, slide and coverslip together with a clear durable film. The medium is important to the image formation as it affects the specimen's rendition. Until recently the most commonly used general mounting medium was DPX (Depex), this has been replaced by Entellan. Mounting media are often chosen for a specific refractive index (R.I.), which can enhance specimen details or make them invisible. Materials like glass become totally invisible if immersed in a solution of the same refractive index. Glass chips can be identified by their R.I. All common mounting media use an R.I. close to that of borosilicate glass (coverslips), but a minor change of R.I. can improve the visibility of particular specimens. Most microscopists use a general mounting medium - like Entellan, but for special requirements like water-miscible, different R.I. or a need for an anti-fadent (especially in fluorescent microscopy), search for a special medium is advised. Do not use immersion oil on an uncovered slide. If in a hurry to view a specimen under oil immersion, mount the slip and handle the mount carefully, keeping it horizontal. Oil can be applied, but do not attempt to wipe it off until the mounting medium is cured - at least overnight or an hour on a hotplate or in an oven. Do not store mounted slides vertically for 2 days if cured at room temperature. Slides should be stored in a dark (slidebox) and cool place to slow fading of stains. Except for some special stains and mountants, mounting media and stains will last for decades and deterioration is very slow. Replacing DPX (Depex), which is no longer made in Australia. Dissolved in xylene, a combination of several synthetic resins makes Entellan® New a particularly rapid embedding agent. It can be used for all dehydrated microscopic preparations. Embedded preparations can be filed for years without changes occurring in their colour. Constant properties ensure its high quality. These mounting media are designed to reduce the fading of the fluorescence of dyes used for labelling biological specimens. 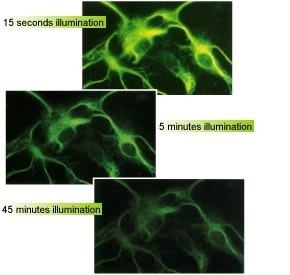 In fluorescence microscopy, the fluorescence is stimulated by high intensity UV and/or visible light. Absorption of the light creates an excited state of the dye (usually a singlet state) and this leads to fluorescence. However, the excited state of the dye may undergo chemical reactions which lead to its destruction as evidenced by the fading or bleaching of the fluorescence and consequent loss of the image, or in the case of assays, a change in signal intensity during measurement. These products have a long shelf life, at least 2 years, and can be stored at room temperature. With an LD50 of >2000 mg/kg (rat) none of the solutions should pose a toxicological problem. Some mounting media oxidise rapidly upon exposure to air, forming carboxyl groups. This can be more pronounced when sections have been cleared in a solution containing aldehyde. It is sometimes observed that the immunogold/silver signal fades after a few weeks, or even in a shorter time, from sections that have been mounted with these media under cover slips. The silver is still present, but has formed translucent silver carboxylate salts. Visibility can be retrieved by removing the cover slip and washing in xylene and then immersing the slide in photographic developer, but this is a tedious procedure. BioMount™ is a specially formulated mounting medium that reduces fading of immunogold/silver signals in sections on glass slides. It is suitable for resins as well as wax embedded sectionsof tissue. Store at RT. Premium quality; formulated from the highest quality advanced acrylic resin. It will not become brittle and crack, nor will it discolour or yellow with age. 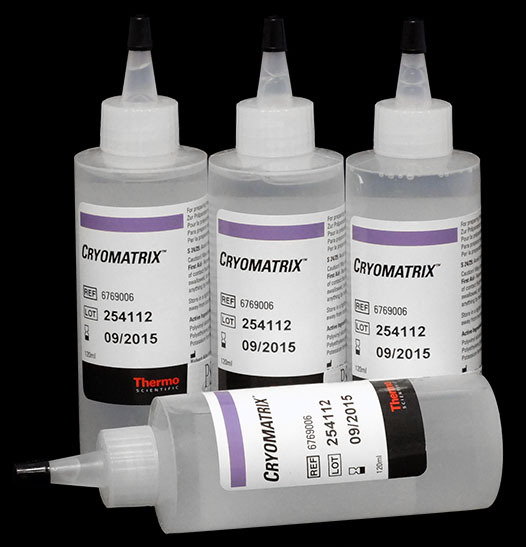 Cytoseal dries rapidly, allowing examination soon after application. It can be used with oil immersion objectives and in fluorescent procedures. Slides will not stick together and the medium will not "cold flow" to the edge of the slide during long term storage. Cytoseal can be dissolved in toluene or xylene. An antioxidant has been added to the formulation to prevent fading of slides. Cytoseal comes in a Controlled Drop Dispenser. Cytoseal™ 60, which has a viscosity of 60cps, is intended primarily for use with cover glass. Clear-Mount is a direct substitute for Biomeda Cystal/Mount™. Fluoro-Gel is a direct substitute for Biomeda Gel/Mount™. Both are also available with an alternative buffer (PIPE for Clear-Mount and TES for Fluoro-Gel) for a more stable pH. These non-hazardous, water-based mounting media are ideal for mounting immunohistochemical stained tissues, which can be damaged by, or are soluble in, organic solvents such as xylene or toluene. Hence, tissue sections stained with chromagens such as 3-amino-9-ethyl carbazole and those using coupled dye systems with BCIP, naphthol-phosphate salts, etc. are best preserved using aqueous mounting media. Clear-Mount allows for post-mounting of the specimens with Permount mounting medium. DAPI-Fluoromount™ G is a water-soluble, instant blue nuclear probe fluorescing (455nm) compound for mounting fixed slides using a staining procedure having an aqueous final step. Mounting slides with DAPI Fluoromount™ G stains the cell nucleus and may reduce fluorochrome quenching during analysis of slides by fluorescence microscopy. this mounting medium also provides a semi permanent seal for long term storage of slide preparations. Fluoro-Gel III mounting medium is similar to Fluoro-Gel. 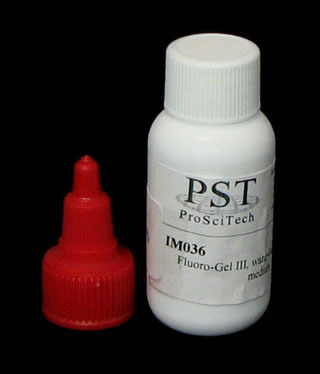 However, the addition of PI (Propidium Iodide), which is a counterstain for DNA, makes this a unique mounting medium, which prevents rapid photobleaching of FITC, Texas Red, AMCA, Cy2, Cy3, Cy5, Alexa Fluoro 488, Alexa Fluoro 594, Green Fluorescent protein (GFP), Tetramethylyrhodamine, Redox, Phycoerythrin (RP-E), Phyocyanin (PC), and Allophycocyanin (APC). The fluorescence is retained during prolonged storage at 4°C in the dark. This medium does not contain Phynylenediamine, which destroys immunofluorescence of Cy dyes, RP-E, PC, and APC. This product is to be used in in situ hybridisation techniques or other method where fluorescence of DNA staining is required. PI excites at 535nm, emits at 615nm, producing a red fluorescence. RNA is also stained with PI. Fluoro Gel with antifading agent 1, 4-Diazobicyclo-(2,2,2)-octane (DABCO™) is an aqueous mounting medium for preserving fluorescence of tissue and cell smears. This unique formula prevents rapid photobleaching of FITC, Texas Red, AMCA, Alexa fluoro 488, Alexa fluoro 594, Cy dyes, tetramethyly rhodamine, and Redox. The fluorescence is retained during prolonged storage at 4°C in the dark. Meltmount (optical quality) is a mounting medium formulated for use in microscope slide mounting and in other optical coupling applications. Instant thermal mountants that require "no-oven-time". 100% usable; contains no solvents. Thermally, reversible for particle retrieval or re-orientation. 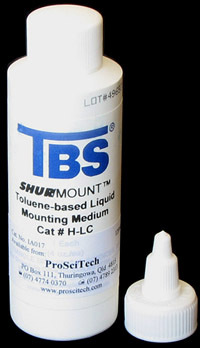 Soluble in toluene for special techniques or clean-up. Fluid at 65°C, a temperature that makes mounts "permanent" but protects the majority of specimens from thermal changes. Meltmount is supplied in an easy-to-use Quick-Stick™. Meltmount sticks can be applied to a slide on a hotplate. The slide is available for microscopy as soon as the specimen and coverglass are positioned and the slide has cooled. The coverglass of this "permanent" slide, however, can be lifted any time by reheating the slide. This makes it possible, for instance, to retrieve a particular particle. Each Quick-Stick™ weighs approximately 18g. I011-1539 1.539 Meltmount™ 1.539 has a refractive index (ND @ 25°C) of 1.539 and an Abbe V dispersion of 45 making it optically similar to Canada Balsam and, therefore, ideal for mounting many biological specimens but without the long drying time of Canada Balsam. I011-1582 1.582 Meltmount™ 1.582 has a refractive index (ND @ 25°C) of 1.582 and an Abbe V dispersion of 33. Its optical clarity makes it the preferred choice for minimum visible absorption. I011-1605 1.605 Meltmount™ 1.605 has a refractive index (ND @ 25°C) of 1.605 and an Abbe V dispersion of 30, making it appropriate for mounting asbestiform Tremolite, Anthophyllite, and Actinolite. I011-1662 1.662 Meltmount™ 1.662 has a refractive index (ND @ 25°C) of 1.662 and an Abbe V dispersion of 26, optically similar to Aroclor 5442, but is PCB-free. I011-1680 1.680 Meltmount™ 1.680 has a refractive index (ND @ 25°C) of 1.680 and an Abbe V dispersion of 25, making it appropriate for mounting Amosite and Crocidolite asbestos. 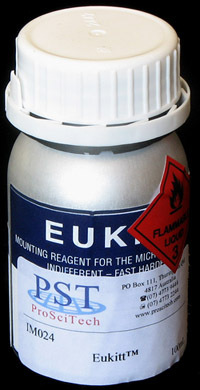 Eukitt is a mounting medium (contains 45% acrylic resin and 55% xylenes), used in microscopy. It is an adhesive and specimen preservative that can be used manually and in automated coverslipping equipment. Special purpose adhesive and sealant for use with glass, non plastic and other non-reactive materials. It spreads quickly and evenly without forming any air bubbles. Properties: Fast-drying (20 minutes), Refractive index close to that of glass (1.510), chemically neutral, little sensitivity to water, no reaction to staining, temperature limits: 42°C-17°C,not affected by ultraviolet light, non yellowing, unaffected by cold, stays optically clear for over 10 years, can be used in place of epoxy resins for mounting petrographic thin sections, used in fluorescence dyes in bones. Store at RT. It has a refractive index of 1.52, which is near that of a fixed protein and this helps to keep images free from distortion. Ideal for mounting coverslips to slides with thick or thin specimens. Permount preserves most biological stains with little or no fading when the slides are stored in darkness. It contains an antioxidant to prevent the formation of annular rings and its high softening point of 155°C makes it suitable for microprojection. This is available in sheet form 254 x 254mm. To use, remove the paper backing exposing the adhesive layer. The substrate is positioned on the film and pressed down firmly so that it adheres to the plastic film. No heating is required. The wafer mounted on the plastic film can then be held down using a vacuum manifold or mechanical means for dicing or scribing. After dicing or scribing, the parts can be separated from the wafer-mount 559 film by washing in acetone or MEK. Ideal for holding down silicon wafers, alumina, or glass substrates for scribing. A temporary adhesive. These wash-away adhesives are used as a temporary bond for holding delicate crystals, metallurgical specimens, glass components, and ceramic substrates for dicing, slicing, drilling and polishing. These materials adhere readily to metals, glass, ceramic and then can be washed, after machining away using various solvents. Machining or slicing single crystal metal specimens. Grinding and polishing sapphire, ceramic, optical garnets, ferrites, and LCD glass. Dicing and slicing germanium and silicone wafers in semiconductor production. Dicing and slicing alumina and beryllia substrates for IC and microelectronic production. Holding beam leads in IC devices for pull-off tests. Dicing subminiature chip capacitors and microwave IC substrates. Offers excellent adhesion to metals, glass, and ceramic. This material is the best for precise high purity work since it leaves no residue after dissolving and does not clog the diamond wheel as compared to conventional waxes. Each stick weighs about 90 grams. Is the same as 509 but used in applications where it is desirable to have a temporary bond which is water soluble. Each stick weighs about 90 grams. Is the same as 509 but offers maximum adhesion to subminiature parts. Each stick weighs about 225 grams. 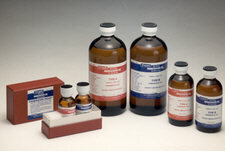 Cargille was first to introduce PCB-Free immersion oils in 1972. Though all immersion oils are now PCB free, no other immersion oil meets FDA criteria; and Cargille's exceeds ISO, DIN and all instrument manufacturer's standards. Minimum shelf life of these immersion oils is 5 years and can be twice that. Blending Oils from the Miscible Group: The Miscible Group of immersion oils is A, B, NVH and OVH. Users can easily blend any two immersion oils from the Miscible Group to obtain an immersion oil with an intermediate viscosity while maintaining the optical properties common to both. Type 37 can be blended with type B. All Cargille immersion oils are classed as low fluorescence, however, for work with weak fluorescence, types FF and LDF - see below - are required. 50mL is supplied in a high density polyethylene bottle with a pointed, twist closure suited to place single drops onto slides. For refills and large users these oils are available in larger glass bottles and in the original 1 US gallon (3.785 litre) steel cans with resealable pouring spout. We stock the gallon container for type B only, but will procure other types on indent within three weeks. For Normal Light Microscopy use Types A and B.
Elevated Temperatures (>23°C to 37°C): Use Type 37. Inverted, Inclined, Projection, and Long Focus Instruments: Use type NVH or OVH. the greater the gap between the cover glass and objective, or between the slide and condenser, the more desirable high viscosity becomes. Their very high viscosities give excellent results for these applications. 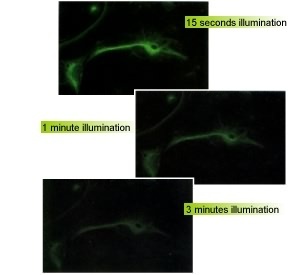 Fluorescence Microscopy: Extremely low fluorescence is achieved by Type LDF and Type HF. These two types practically vary only in viscosity and they are interchangeable and miscible with each other for intermediate viscosities. Produced in larger quantities than other types, Types A and B are the most economical. The deciding factor in choosing between them is the optimum viscosity for your particular application. Type A, at 150 centistokes, reduces any tendency to trap air, especially helpful to beginning students. Air bubbles cause image degradation. Also Type A is less sticky and easier to clean up. Type B, at 1250 cSt, is thick enough for viewing multiple slides with one application. This saves time during batch processing. Type B is the most used of these immersion oils. For a greater gap between cover glass and objective, (or condenser and slide) type B is more desirable. For horizontal, inverted and inclined instruments and projection equipment, Type NVH with high viscosity of 21,000cST or Type OVH with a viscosity of 46,000 cST, (about 3 times that of honey) should be used. These types combine high or very high viscosity with "normal" refractive index properties. The greater the gap between the cover glass and objective, or between the slide and condenser, the more desirable high viscosity becomes. Their very high viscosities give excellent results for these applications. Elevated temperatures can be due to substage illuminators, "hot stage", or other causes - ideal situations for Cargille Immersion Oil Type 37. Immersion Oil Type 37 is useful for microscopic studies at body temperatures or when high room and stage temperatures may approach 37°C. Developed specifically for working at human body temperatures, Type 37 has a refractive index of 1.515 and a viscosity of 1250 cSt at 37°C solving the problem of image degradation above the standard calibration temperature of 23°C. Since the refractive index/ temperature relationship is inverse, increasing temperature significantly reduces the refractive index and lowers the viscosity of immersion oils. Cargille resolved this problem with Type 37 immersion oil. For any Elevated Temperatures (>23°C to 37°C) use Type 37. Users can blend for their own working temperature; blending Type B, with a viscosity of 1250 cSt at 23°C with Type 37, 1250 cSt at 37°C maintains a constant 1250 cSt viscosity and optical values and places the temperature of calibration proportionally between 23°C to 37°C. 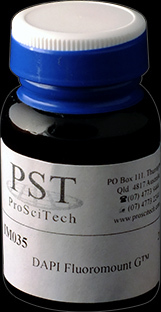 This is in most regards our best immersion oil for fluorescence microscopy. It has extremely low background fluorescence (Cargille # 1-2). It has excellent optical values of refractive index (1.515 at sodium yellow 5893 angstroms and 1.518 at mercury green 5461 angstroms) and dispersion (41.3 for Abbe υD) for a sharp image. It has a medium viscosity of 500 cSt. It has an odour, (1-bromonaphthalene), that some people dislike. This oil is halogen free, has no odour, and is also nearly free of background fluorescence (Cargille # 1 max.). For optical properties its refractive index is 1.479 at 5893 angstroms which is lower than the ideal 1.515 so image sharpness is less, but probably not noticeably. It has a low viscosity of 170 cSt. Automated Hematology Systems: Use Type 300; Automated Hematology Systems depend on accurate, precisely controlled physical and optical properties of immersion oil for successful imaging and mechanical processing. Type 300 is designed and manufactured to meet the stringent requirements of this equipment, which include specialised viscosity and exacting controls for its consistency. Cargille Refractive Index Liquids have become standard items in many laboratories as their applications have expanded from routine mineralogical identifications and quality control. New and broader uses in many more fields such as chemicals, engineering, medical, forensic, optics, and instrumentation are continuously discovered. Many special requirements for specific applications have created a need for more technical data, new formulations, extended ranges, smaller increments and higher degrees of precision. Since 1942, Cargille Laboratories, Inc. has been filling this growing need. And today, the largest and most comprehensive assemblage of refractive index liquids - over 250 stocked items - are available for science, industry, medicine, and education. For specialised and unusual applications, many more can be formulated and others are routinely researched in anticipation of new needs. Chlorofluorocarbon (CFC) components used in some Cargille optical liquids have physical properties that are harmless to the ozone layer, unlike those found in refrigerant gases, propellants, and solvents, which are destructive. The components used by Cargille Laboratories have vapour densities ten times that of air, are relatively nonvolatile, and have boiling points at least 100°C higher than the highest-boiling CFC of those listed for removal from commercial use by the Montreal Protocol. Cargille Refractive Index Liquids have a broad range of applications in diversified fields. The following table briefly illustrates some of the typical areas of use. IDENTIFICATION.................. Identify minerals, ores, chemicals, specimen fragments, plastics, gems, translucent or transparent solids by microscopic immersion techniques. MOUNTING MEDIA.............. Temporarily mount specimens in various index media for matching or contrasting index combinations. OPTICAL ANALYSIS............ Microscopically study solids by dispersion staining, focal masking, and double variation refractometry techniques with high dispersion liquids. REFRACTOMETRY.............. Calibrate refractometers and other optical instruments. EDUCATION........................ Instruct and exhibit principles and applications of refraction. SPECTROPHOTOMETRY..... Determine refractive index of specimens by referral to calibration curves relating wave length to index of refraction. TOXEMIA............................. Identify salts precipitated from body fluids and measure relative amounts of sodium and potassium chloride for indicating toxemia. OPTICAL COUPLING........... Couple optical elements with liquids formulated for refractive index and viscosity. OPTICAL LENSES............... Obtain unique optical properties of hollow lenses by filling with index of refraction liquids. ELECTRO-OPTICS............... Examine and preserve cathode coating without stripping or re-immersion by utilizing oils matching index of crystals. POLLUTION......................... Identify particles and particulates from air or water. FLUID FLOW....................... Photograph flow patterns by filling test system with refractive index liquids having suspended "beads".